I’ve always fantasised about having a kiln in the garage (Eben wants a pick and place machine; we need another garage). Kilns, though, are expensive. And where do you start if you want to refurbish a broken or old one safely? James Gao has an answer, and it’s got a Raspberry Pi in it. (Well, not in it, but attached very firmly to it. James’s girlfriend is an enthusiastic potter, and James is an equally enthusiastic hacker. They came together and made beautiful music a kiln. The project is based around an old electric kiln, which James built holes into to convert it into a propane-fired updraft kiln. 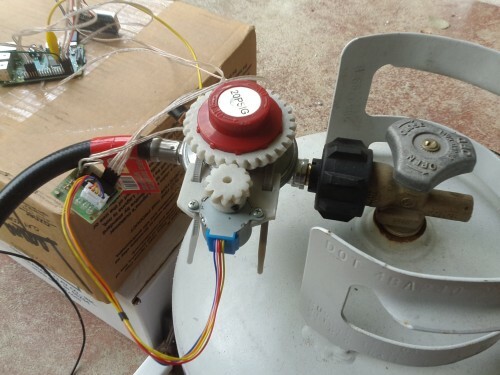 A Raspberry Pi is hooked up to a thermocouple and a stepper motor that controls the propane regulator. James 3d-printed gears and a clamp to operate the regulator/motor setup. The kiln operates via a PID, which controls the temperature taking closed-loop feedback from the thermocouple to the regulator. Adjustments can be made remotely; the kiln controller system has WiFi. James has a really interesting series of photographs, with explanatory text and some examples of test firings, over at imgur; he also answers questions about the project at Reddit. 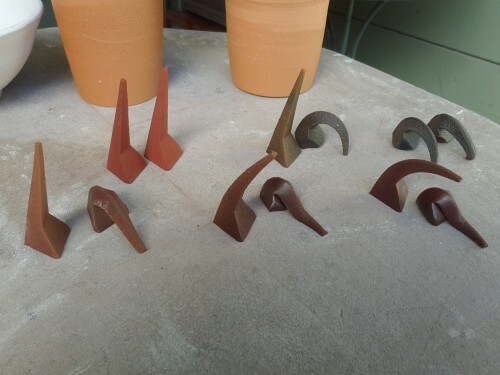 Results of two test firings – the variously floppy things are pyrometric cones, used to measure temperature in different parts of the kiln. There are so many reasons I love this project. It’s a wonderful demonstration of what can be done with no specialised experience (James had never worked with kilns before starting this project, and neither he nor his girlfriend had any knowledge about firing pottery). The ingenuity on show is just brilliant (3d-printed gears! ), the pottery that comes out of the end is immensely satisfying – and face it; there’s something very thrilling about flames. On top of all this, the whole project came in at less than $200. All James’s control software, along with a BOM, is open-source, and available on GitHub. ha! Along with the canoes. You are an danger of having a Rachel’s Corner. … I wonder what cool hacks we can do with the canoes next year too. A+ with a battery would last for ages…. hmm…. Lasers – must be able to fasten some of them onto a canoe somewhere. My next canoe is likely to be an inflatable one (planning on some flat paddling with the kids when camping) – so I’d probably just end up sinking the canoe. Excellent project. Just needs an oxygen sensor adding and you could have closed loop control of the atmosphere for oxidising / reducing . . . I don’t know about English electrical standards, but in the US, the stepper motor regulator is in violation of NFPA 70: National Electric Code requirements. Hate to rain on anyone’s parade but I have to point out the hazard. Is the NFPA not for mains voltage(~50+V)? There is no such exception for equipment operating at 50V or below. The actuator must be designed, tested and approved by a qualified testing agency for use in the classified area in question. Just as an example, an item that is exempt from NEC requirements that the apparatus must be listed is a “simple apparatus” defined as an electrical component or combination of components of simple construction with well-defined electrical parameters that does not generate more than 1.5 volts, 100mA, and 25 mW, or a passive component that does not dissipate more than 1.3 watts and is compatible with the intrinsic safety of the circuit in which it is used. No hazards? Are you serious? Put the Electrical Codes aside for a moment. With the best will in the world, software and hardware doesn’t always do quite what you want it to do, and combining it with control of flammable gases needs some care and attention. A system like this ideally needs an independent safety shutoff of some kind. Again, apologies if this is already in the instructions (I did look, I couldn’t see it). Keep on hacking, but please do it safely. Use the whole head, thanks. Liz; Have a root around the skips at the back of the chemistry dept. An old Muffle furnace can make a good small kiln for small pieces or plaques..
Looks great! If you can think of a way to create a Raspberry Pi woodstove monitoring system that controls (primary and secondary) airflow(s) based on the oxygen content of the exhaust fume mixture, you’d find a lot of interested parties. So some of you know the NFPA, good for you. If your goal was to apply a giant “This is Dangerous” sign to the project, pat yourself on the back, job nicely done. Propane is dangerous, yes. No one fires up a kiln and walks away, particularly an updraft propane-fired kiln. This is a research project showing the potential of RPI and 3D printing in repurposing and resurrecting an old kiln. It’s not going to get sold, marketed, whatever. Improvement is imperative. I have no doubt that Eben and Liz will pay attention to your points and improve safety in line with the experience they have yet to gain with their new concept. To Moderator: I just realized my name is the same as James (Gao). Please delete my prior comment with my blessing if this will cause confusion. Did you design the circuit board to read a thermocouple resistance and lookup a temperature? which thermocouple type did you design for – TC(K,J,S,E)/ RTD(Pt100,CU50)? How often did the Pi read temperature? I would like to do the same for my charcoal smoker controller. fwiw, Over 30 years ago, I built an electric Kiln Controller using a Tandy Model 100 that my wife used to control two 32″ kilns firing porcelain to cone 10 for 25 years. We destroyed a lot of pottery learning how to best use it’s capabilities, but, since her work was so thin, the controller eventually reduced her breakage during firing from over 10% to zero. I just purchased a Raspberry Pi 2 and planning to make recreating this controller my first project. The control design was based on timing power cycles… for example, switch on for 25 seconds, then off for 75 seconds means that the heating elements are outputting 25% of their capability. And, obviously, this is very easy to control with software. The original program allowed the user to input multiple heating and cooling steps… for example to reduce the thermal shock as the kiln heated as well as allowing a “flat point” during the temperature increase to transition the quartz inversion temperature as well as controlling the rate the temperature would decrease after the peak temperature (cone melt) was achieved to prevent breakage due to shrinkage during the cool down period. Using “time based” temperature control as opposed to “sensor based” temperature control we could control the temperature so accurately we able to hold the conditions necessary for “crystal growth” in the molten glaze in the minutes after peak temperature was achieved. 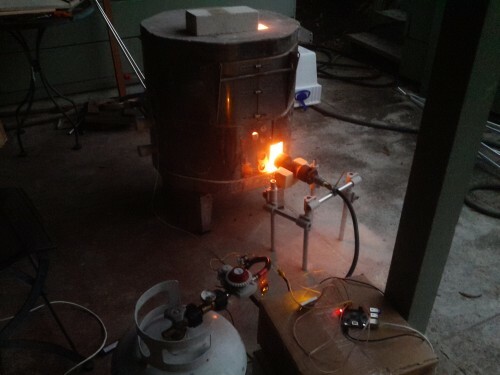 Peak temperature was sensed, not by thermocouple, but by using a KilnSitter which would drop a weight when the cone melted onto a microswitch rather than powering down the kiln. Hope that this information is helpful. I also posted the same on the Reddit thread started by James.